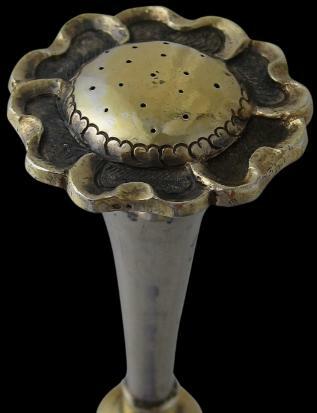 This spectacular rosewater sprinkler is the tallest and finest Chinese export silver example that we have encountered. It has thick silver walls. 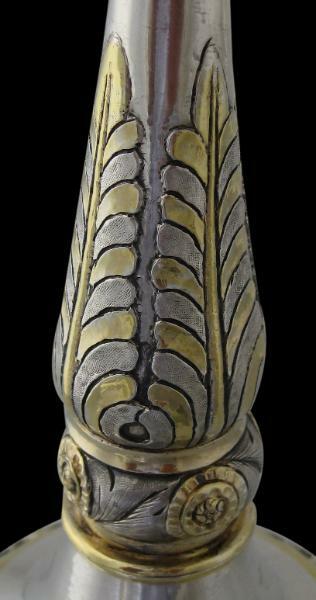 Parcel gilding has been used across the piece to maximum effect, most strikingly on the acanthus leaves on the stem with each part of each leaf being alternately gilded. 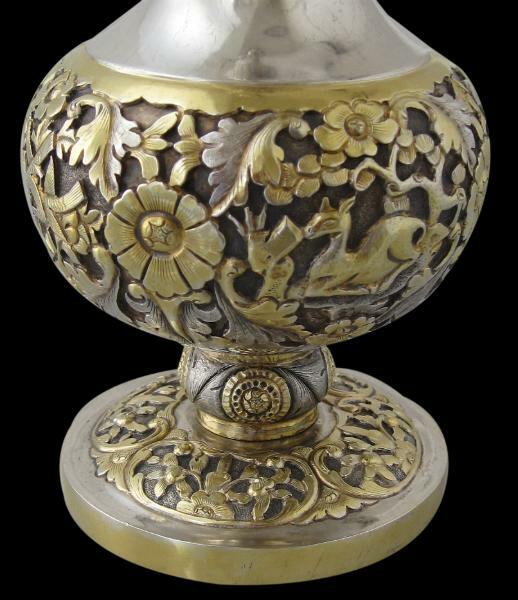 The bulbous base is deeply chased with deeply cut and engraved flowers, scrolling foliage and various animals – a peacock, storks, humming birds, and a deer – all against a fine ring-mat background, and with delicate parcel gilding. 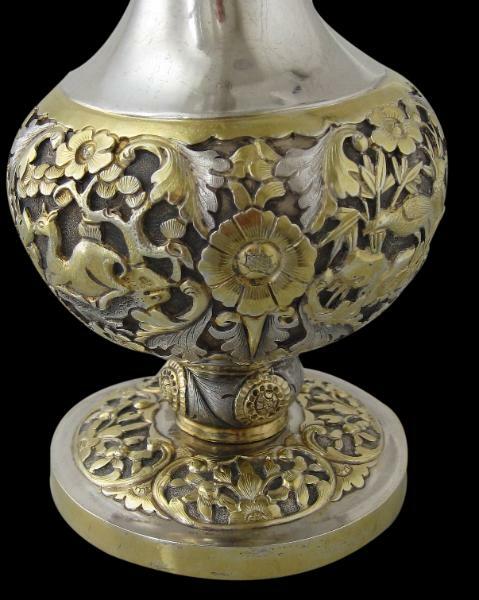 The splayed foot is beautifully chased with scrolling foliage and flowers also with mercury parcel gilding. 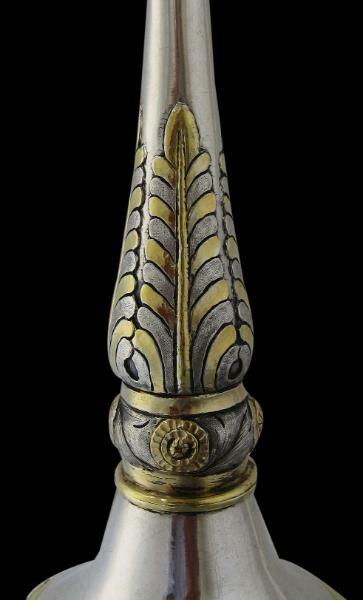 The nozzle is in the form of a flower and this too is gilded. The base is stamped by the maker that has become known as ‘Gothic K’ as per the Gothic nature of the ‘K’ stamp used to mark his work. But the actual identity of this maker is not known. It is accompanied by what appears to be a Chinese ideogram. If indeed that is what it is then the nearest approximation for it is ‘zhen’ that approximate translation of which is ‘strategy’. 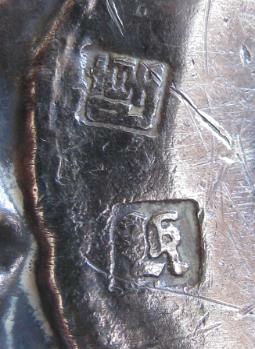 The Gothic K stamp is often accompanied by Chinese or pseudo Chinese marks that are either unusual or difficult to read. These marks tend to differ from piece to piece. The sprinkler is in very fine condition. It sits firmly, has no splits, dents or repairs. 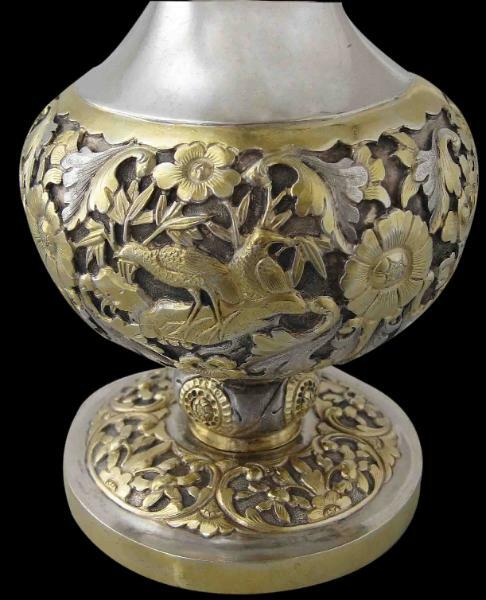 In so far as earlier Chinese export silver goes, it is a exceptional example. 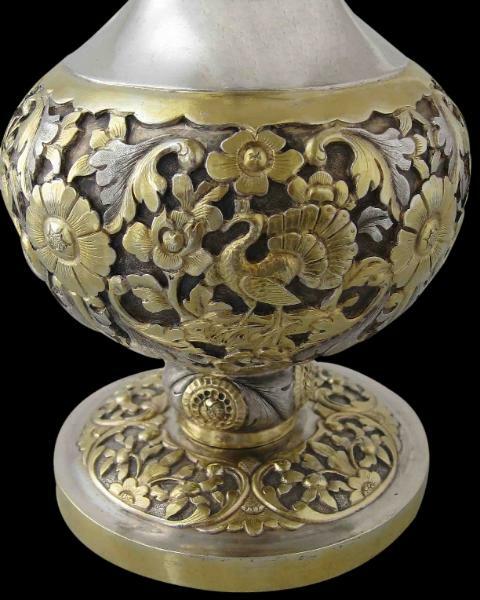 Kernan, J.D., The Chait Collection of Chinese Export Silver, Ralph M. Chait Galleries, 1985; and Forbes, H.A.C. 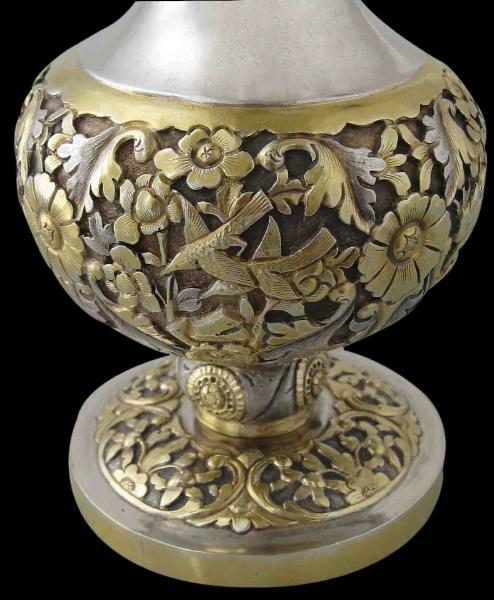 et al, Chinese Export Silver 1785-1885, Museum of the American China Trade, 1975.